A young woman longing for independence. Immigrants adjusting to life in a new country. A man struggling with the social change happening around him. 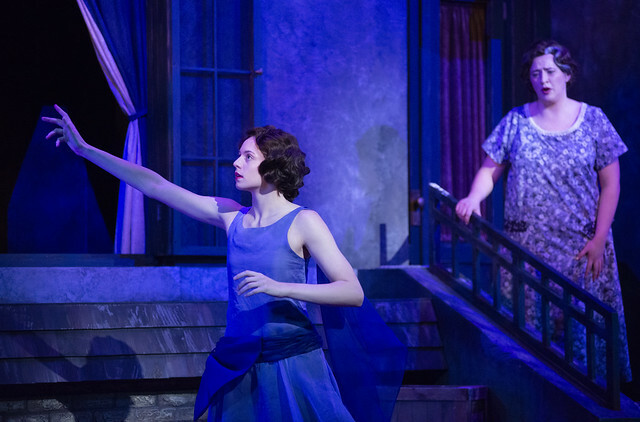 These are some of the experiences explored in Kurt Weill’s opera “Street Scene,” produced by the School of Music’s Maryland Opera Studio (MOS) and on stage at The Clarice from April 12-20. Based on a book by Elmer Rice with lyrics by Langston Hughes, “Street Scene” is set in a tenement in a 1920s New York City and portrays life among a diverse group of working-class people who serve as a microcosm of American society. The piece was composed by Weill in the 1940s but is still extremely relevant today as it digs into issues around immigration, racism, social class and domestic violence. The story revolves around Anna Maurrent, a wife and mother who is trying to reach beyond her current circumstances. “Street Scene” is being produced as part of the School of Music’s Kurt Weill Festival, a yearlong celebration of the composer’s life that is a feature of the university’s Year of Immigration. The Festival gives students and audiences the opportunity to examine the breadth of Weill’s music and to learn about the experiences that helped shape his work. Weill, one of the most influential composers of the twentieth century, fled Nazi Germany, eventually immigrating to America in the 1930s. He composed for numerous musical genres and, in “Street Scene,” he blurs the lines between opera and musical theater. Although Weill exposed the racism and biases he observed, the piece contains some character stereotypes and microaggressions that stand out to today’s audiences. In response, MOS’ fresh staging of the Weill classic cast a diverse group of singers and actors to depict a complex community that isn’t as racially divided as life was in the ’40s and as the piece was originally written to be. "We’re hoping that people see the strength in this diverse community,” says Consol. MOS students are also excited to sing in a work that provides a unique chance for discovery and exploration. The Maryland Opera Studio performs “Street Scene” April 12-20 at The Clarice. This event is part of the Kurt Weill Festival funded in part by the Kurt Weill Foundation for Music, Inc., New York NY. Performances are also part of the Year of Immigration, which aims to transform dialogue into impact on urgent issues related to immigration, global migration and refugees, and to foster open conversation and greater connection with the University of Maryland’s large and diverse international community. Tickets available via The Clarice.